The difference in return between an investment one makes and another that one chose not to make. This may occur in securities trading or in other decisions. For example, if a person has $10,000 to invest and must choose between Stock A and Stock B, the opportunity cost is the difference in their returns. If that person invested $10,000 in Stock A and received a 5% return while Stock B makes a 7% return, the opportunity cost is 2%. One way of conceptualizing opportunity cost is as the amount of money one could have made by making a different investment decision. Importantly, opportunity cost is not a type of risk because there is not a chance of actual loss. The best alternative that is forgone because a particular course of action is pursued. An example is the interest income that is given up when large balances are kept in a checking account. Likewise, purchasing a home means that less money is available for another investment. When you make an investment decision, there is often a next best alternative that you decided not to take, such as buying one stock and passing up the opportunity to buy a different one. The difference between the value of the decision you did make and the value of the alternative is the opportunity cost. If you decide to invest in a risky stock hoping to realize a high return, you give up the return you might have earned on a bond or blue chip stock. So if the risky stock fails to perform, and you only make 3% on it when you might have made 6% on a blue chip, then the opportunity cost of the risky investment is 3%. Of course, if your stock pick pays off, there will have been no opportunity cost, because you will make more than the 6% available from the safer investment. Businesses must also consider opportunity costs in their decision-making. If a company is considering a capital investment, it must also consider the return it would earn if, instead of going ahead with the capital project, it invested the same amount of money in some other way. In general, a business will only make a capital investment if the opportunity cost is lower than the projected earnings from the new project. a comparator against which to measure the return on the use of resources in some particular activity, as compared to the return which the same resources could earn in some other alternative activity. For example, a firm may employ its limited factory capacity in the production of dining tables or alternatively coffee tables, and would measure the opportunity cost of manufacturing dining tables in terms of the profits it might have earned from making coffee tables. For an illustration of the broader financial implications of this concept see the entry ECONOMIC VALUE ADDED. See LINEAR PROGRAMMING. a measure of the economic cost of using scarce resources (FACTOR INPUTS) to produce one particular good or service in terms of the alternatives thereby foregone. To take an example, if more resources are used to produce food, fewer resources are then available to provide drinks. Thus, in Fig. 136, the PRODUCTION POSSIBILITY BOUNDARY (PP) shows the quantity of food and drink that can be produced with society's scarce resources. If society decides to increase production of food from OF1 to OF2, then it will have fewer resources to produce drinks, so drink production will decline from OD1, to OD2. The slope of the production-possibility boundary shows the MARGINAL RATE OF TRANSFORMATION (the ratio between the MARGINAL COST of producing one good and the marginal cost of producing the other). In practice, not all resources can be readily switched from one end use to another (see SUNK COSTS). In the same way, if a customer with limited income chooses to buy more of one good or service, he can only do so by forgoing the consumption of other goods or services. His preferences between food and drink are reflected in his INDIFFERENCE CURVE II in Fig. 136. The slope of the indifference curve shows the consumer's MARGINAL RATE OF SUBSTITUTION (how much of one good he is prepared to give up in order to release income that can be used to acquire an extra unit of the other good). 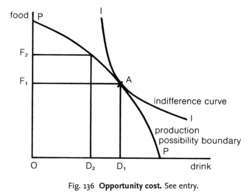 If the indifference curve II is typical of all consumers’ preferences between food and drink, then society would settle for OF1 of food and OD1 of drinks, for only at point A would the opportunity cost of deploying resources (the slope of PP) correspond with the opportunity cost of spending limited income (the slope of II). See also PARETO OPTIMALITY, ECONOMIC RENT. The value of the opportunity given up in order to take advantage of the one you decide to take.The classic opportunity cost evaluation is the “rent or buy decision.”If a person buys a home,the person gives up the opportunity to invest the down payment money in something else. Because mortgage payments and maintenance costs are usually higher than rent, the new homeowner must also spend more money each month rather than investing it. On the other hand, the analysis must take into account tax savings because of the deductibility of home mortgage interest payments.Conducting an analysis of opportunity costs in the “rent versus buy”situation might cause one to buy immediately,buy later,or decide not to buy at all for the foreseeable future.Ginnie Mae has an excellent rent versus buy calculator at www.ginniemae.gov. The computer system monitors other hidden costs, including product-centered problems, which account for 3 to 5 percent of all the products received in the warehouse. Will the equipment produce hidden costs for the client or the agency? ddAP provides direct and immediate bottom-line improvement by recovering hidden costs that would otherwise go undiscovered. Cllr Bob Cook should now produce all these hidden costs to the public, work carried out before any agreements were signed including the costs of a new roof, new landscaping adjacent to the building, footpaths, asbestos removal, etc. Designed to promote self-sufficiency and harness institutionalized intelligence, Procuri solutions can be quickly deployed without expensive hardware and other hidden costs involved in traditional software installations. The card has become popular especially with the customers who have had difficulties with hidden costs. Many costs get buried in the company, and the hidden costs are growing rapidly while the centrally managed costs are declining. Moderated by EDN Senior Editor Michael Santarini, participants will discuss how to identify the hidden costs of IP. The competitively priced, all-inclusive service plans are straightforward and easy to understand, and there are no hidden costs for additional required services, so parents always know exactly what to expect. The CIA program will uncover hidden costs across any purchase category including all Not-For-Resale and For-Resale products in all retail industry verticals. Wherify delivers a competitively priced family locator service with no confusing rate plans, no hidden costs, an easy-to-use, age-appropriate GPS cell phone, and anytime, anywhere calling and location tracking that gives families a straight forward communications and safety service. The session will also explore the hidden costs of data migration and how a rapid data migration return on investment can be achieved.